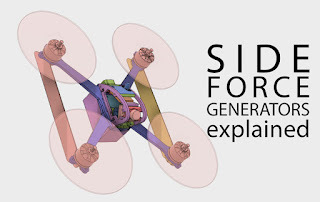 "canopy-tilt-" refers to the hexrotor without canopy and without the inclination of the rotors. 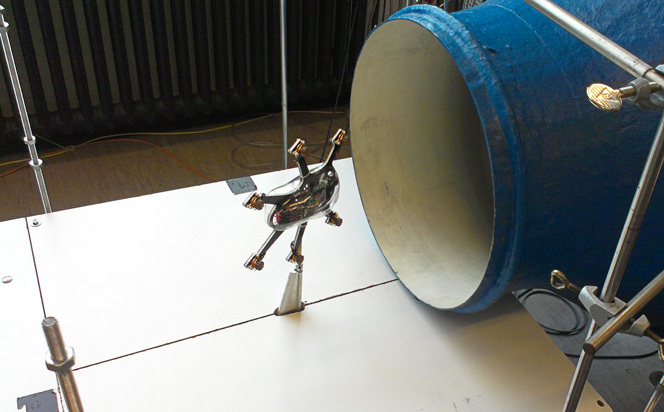 This setup is very much comparable to a conventional, standard hexrotor like e.g. the MM6. "canopy+tilt-" includes the canopy, but no rotor inclination. "canopy-tilt+" is without canopy, but with rotor inclination. "canopy+tilt+" is finally the GEMiNi as I am currently flying it. The results reveal that the inclination of the rotors has a large positive effect on the overall performance. 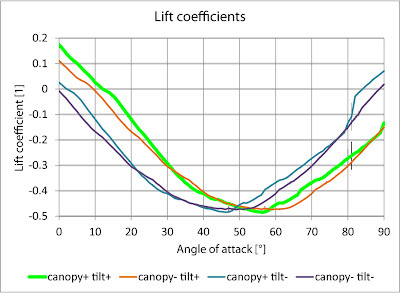 In combination with the effect of the canopy, the rotor inclination reduces the negative lift by 17 % to 70 % at angles of attack relevant to fast forward flight (10° to 45°). Negative lift pushes the copter down in forward flight and must be compensated by additional thrust. This would reduce the maximum flight velocity and requires additional energy. 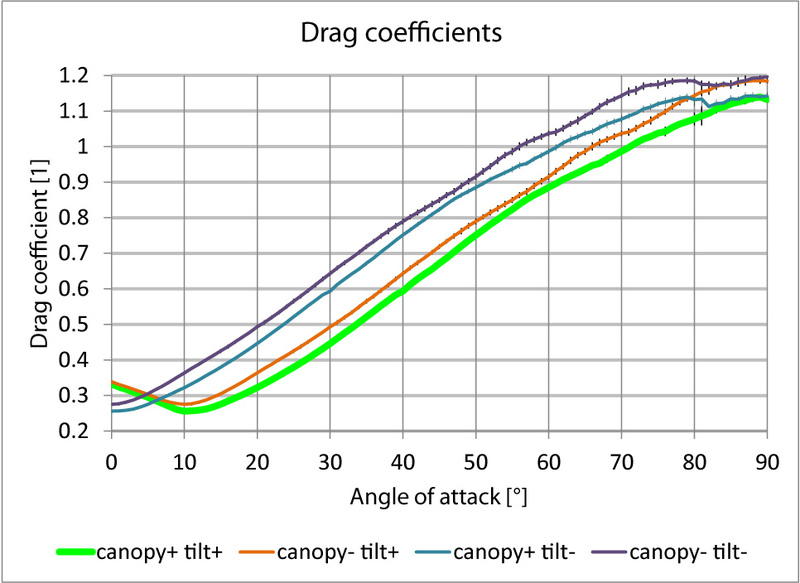 Lift coefficient vs. angle of attack. Large lift coefficients at angles of attack between 10 and 45° result in lower thrust requirements to keep the copter in the air. The application of a canopy and rotor inclination enhances the performance. Additionally (and more importantly), the drag of the copter is reduced by 14 % to 40 %. Aerodynamic drag slows the copter down, so any reduction is clearly beneficial. 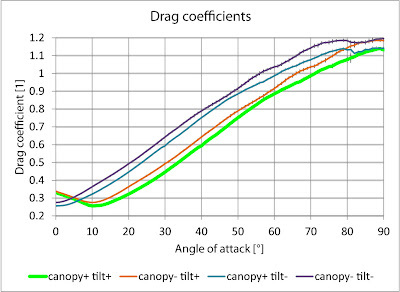 Drag coefficient vs. angle of attack. The drag of the copter is reduced quite dramatically by using the canopy and rotor inclination. Top-speeds will be much higher compared to the conventional setup. 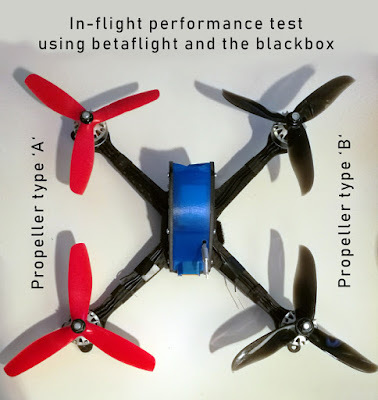 To conclude: The analyses have shown, that the canopy and the rotor inclination both improve the aerodynamic properties of a hexrotor substantially. 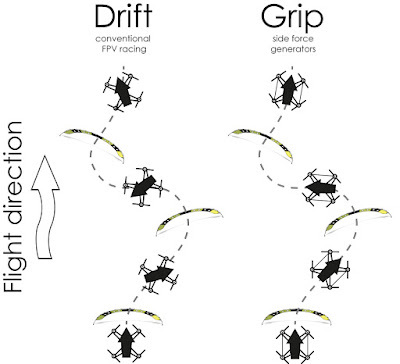 Higher top speeds, respectively a larger endurance during cruising flight will be possible. The additional weight of the canopy is negligible and will hardly influence these conclusions.